Culms 2-40 cm × 0.5-1.5(-2) mm. Leaves: apex of distal leaf sheath obtuse to acute, tooth to 0.3 mm. Spikelets lanceoloid to subcylindric or ovoid, 5-10(-20) × 2-3(-4) mm, apex acute (to rounded); proximal scale empty, encircling ca. 2/3 of culm; floral scales 25-100(-200), 8-12 per mm of rachilla, orange brown to stramineous, 2(-2.5) × 1-1.3 mm, midribs mostly keeled, ovate, apex narrowly rounded to subacute. Flowers: perianth bristles present or often absent, 5-8, brown, stout, rudimentary to slightly exceeding tubercle; stamens (2-)3; anthers brown to yellow, 0.3-0.7(-1) mm; styles 2-3-fid. Achenes 0.9-1.1(-1.5) × 0.7-1.1 mm. Tubercles depressed, subdeltoid, 0.1-0.3(-0.4) × 0.6-0.9(-1) mm, 1/10-2/5 as high as wide, 1/4 or less as high as achene, 9/10 as wide as achene, very rarely 2/5 as high as achene (in E. engelmannii var. robusta). 2n = 10. Fruiting spring-fall. Fresh shores, marshes, disturbed places; 30-2400 m; Alta., B.C., Man., Ont. ; Ala., Ariz.., Ark., Calif., Colo., Conn., Del., D.C., Idaho, Ill., Ind., Iowa, Kans., Ky., Md., Mass., Mich., Minn., Miss., Mo., Mont., Nebr., N.H., N.J., N.Mex., N.Y., N.Dak., Ohio, Okla., Oreg., Pa., R.I., Tenn., Tex., Va., Wash., W.Va., Wis. 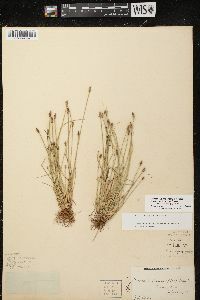 Robust plants known only from Missouri and described as Eleocharis engelmannii var. robusta have well-developed caudices, culms to 2 mm wide (pressed), spikelets to 2 cm, floral scales to 2.5 mm and slightly cartilaginous, styles mostly trifid, achenes to 1.5 × 1 mm, and tubercles 0.3-0.5 × 0.7-1 mm and to 2/5 as high as achene. 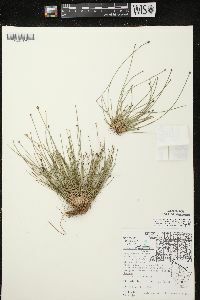 Some specimens are intermediate between E. engelmannii and E. obtusa, or rarely with E. lanceolata. 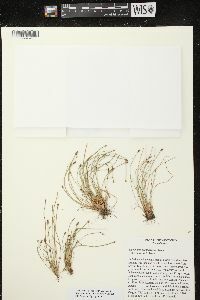 I have not seen specimens to verify literature reports of E. engelmannii from Manitoba, Connecticut, Delaware, Idaho, New Hampshire, North Carolina, Oregon, Rhode Island, South Carolina, South Dakota, or Vermont. Annual herb, tufted 2 - 40 cm tall Leaves: reduced to bladeless sheaths, basal, two per culm, margins fused and enclosing culm, not splitting, with a blunt to pointed apex that often bears a tiny tooth. Flowers: minute, spirally arranged on the axis of the spikelet, lacking sepals and petals, with zero or five to eight bristles, subtended by a scale. Bristles (when present) brown, stout. Stamens three, exserted. Anthers brown or yellow, about 0.5 mm long. Pistil one. Style two- or three-cleft. Fruit: a one-seeded achene, straw-colored to dark brown, 1 - 1.5 mm long, 0.5 - 1 mm wide, lens-shaped. Tubercle tiny, depressed, nearly triangular. Seed with a thin, non-adherent wall. 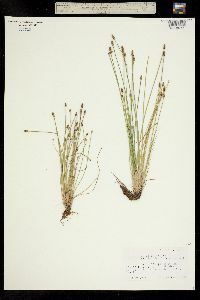 Spikelets: solitary, 0.5 - 1 cm long, 2 - 3 mm wide, lance-shaped to nearly cylindrical or egg-shaped with a pointed apex, with 25 to 100 or more floral scales. Scales spirally arranged and overlapping, straw-colored to orangish brown, midrib keeled, about 2 mm long and 1 mm wide, egg-shaped with a narrowly rounded to almost pointed apex. Culms: many, ascending, unbranched, 2 - 40 cm long, 0.5 - 1.5 mm wide, circular to oval in cross-section, ribbed, enclosed basally by two fused sheaths. Habitat and ecology: Occasional on shores, mud flats, and other moist areas. Etymology: Eleocharis comes from the Greek words heleios, meaning "dwelling in a marsh," and charis, meaning grace. Engelmannii is named after George Engelmann (1809-1884), the botanist who discovered this species. In muddy places in roadside ditches and on the muddy borders of artificial and natural ponds. 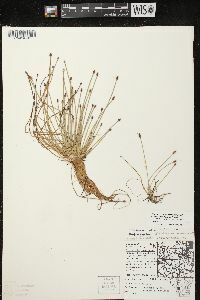 One specimen [of var. 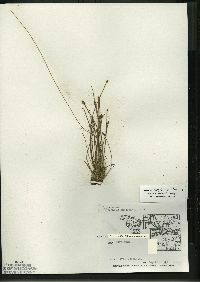 detonsa, a form with rudimentary bristles on the achene,] was collected in a field 2 miles northwest of Culver on the muddy border of a pond, where it was frequent. Also collected by E. J. Hill in La Porte County.